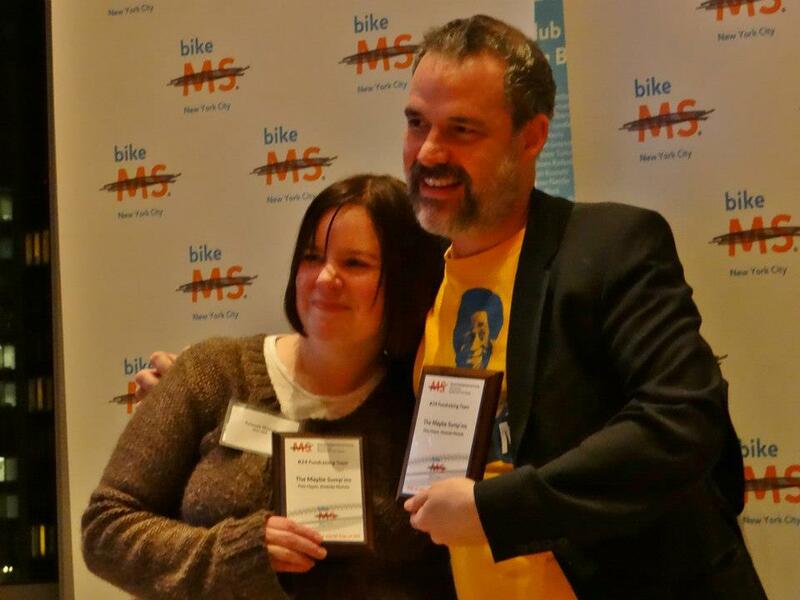 Last year, the Night Ridah attended the BikeMS Recognition Dinner for Crash Safely in New York with Pete Hayes. This year, I was able to make it, along with Crystal Bailey and David Sickorez. They are not only cool neighbors, but regular volunteers with Crash Safely. Crystal also was a virtual rider this year on the team. She also got a new camera recently so happily snapped these photos while the rest of us acted as borderline-mature adults. 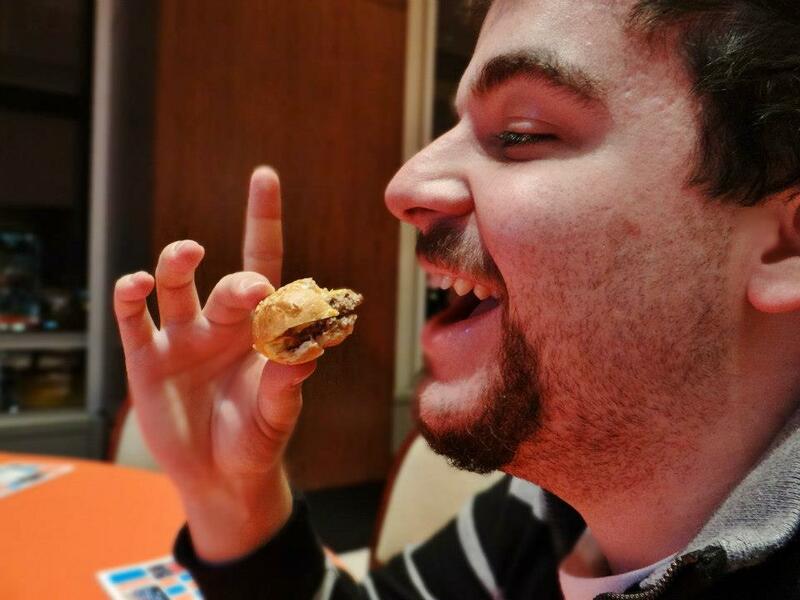 Why yes, we can has cheezburger! We made it in after BoltBus bended time and space drove us from Boston to New York. We were hungry and happy to have random tiny foods make their way to us on platters. We were some of the first people at the event, so we were able to pick out a prime spot for the festivities. I brought photos from the shows and spread them out all over the table, figuring that it would be Maybe Sump’MS central. We were joined by friends from a few of the other bike teams and…. 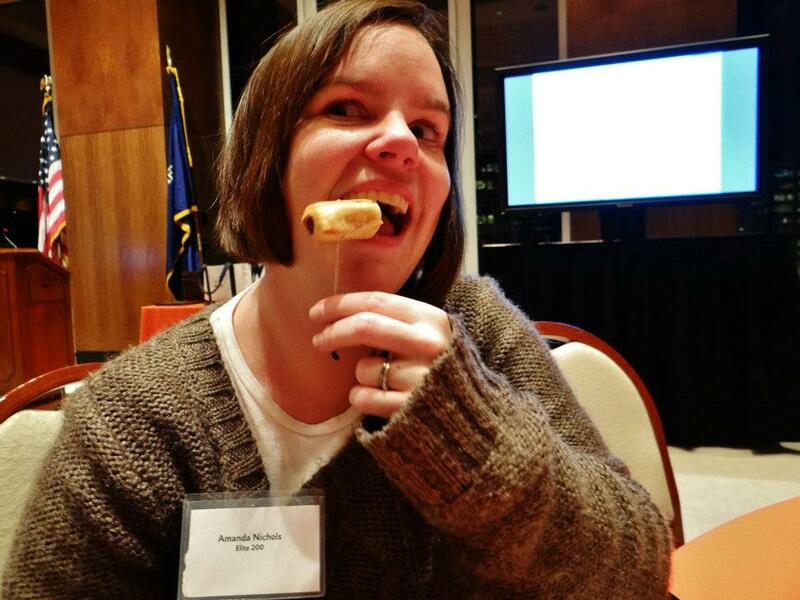 someone from the National board of trustees. Gulp. Fortunately, he just asked what the pictures had to do with MS, in a very friendly manner (meaning the he figured there was a story coming). I was happy to tell him what the photos were, who the bands are and why they were chosen to do the shows. He was impressed with the amount of planning that went into the shows (not to mention Tad’s glitter and The Upper Crust’s outfits). He got up to give the first speech of the night with a big smile on his face. 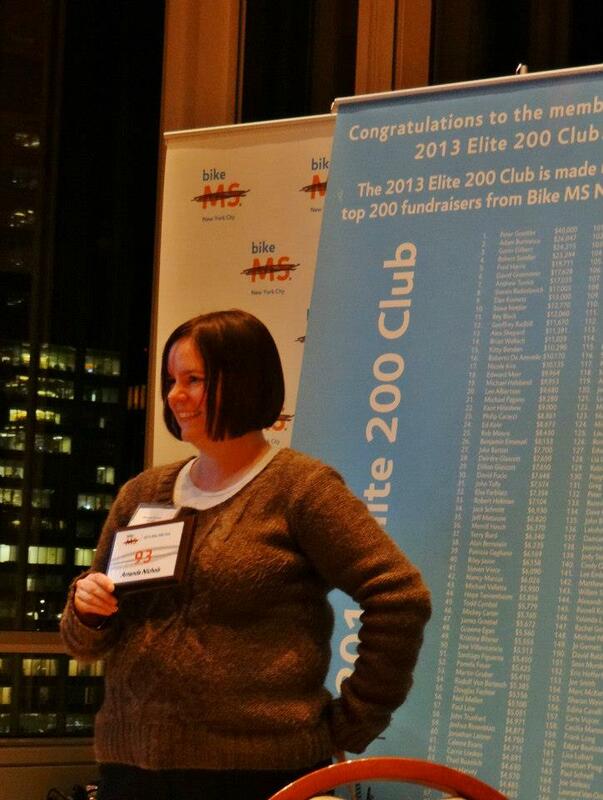 The second speaker was an ambassador from NOW (the National MS Society’s big research operation), who talked about the good that fundraising efforts like BikeMS do for research, especially regarding progressive forms of the disease, which still have no medication to stop the disease from getting worse. She has secondary progressive MS and spoke about her downhill slide, until starting a trial for what would come to be called Ampyra. It’s not a disease modifying medication, but it helped her with her major symptom- her inability to walk. You’d never know it from watching her in the room that night. Then, the moment were were all waiting for: the awards! The Maybe Sump’ms were the #24 fundraising team. This includes the corporate teams (who generally out raise the friends and family teams by large margins). We’re determined to be higher up the ladder for 2013. Pete and I were in the top 100 for individual fundraisers. Pete was #73 as an individual fundraiser. Nothing says “Can you tell I’m wearing three shirts?” quite like how I’m standing here. Pete and I both earned the Golden Circle award as well. That means we had one single donation that was $1,000.00 or more. In my case, that was Crash Safely’s ticket sales. 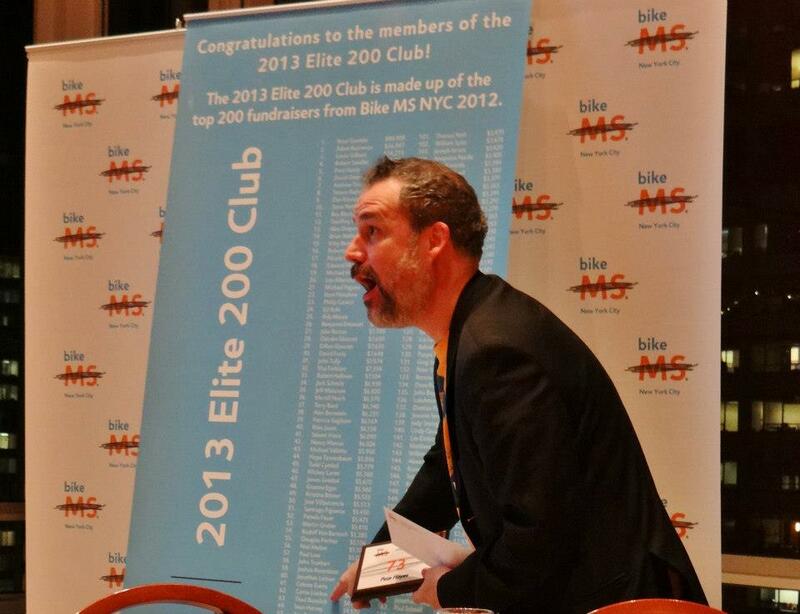 The Maybe Sump’ms will be registering for the 2013 BikeMS NYC ride soon. You can join as a regular or virtual rider if you’d like! We’re also working hard on this year’s shows. Wanna be involved with that? Drop me a line/comment on this post! While it sounds like Boston will blow away by midnight, I just wanted to catch up quickly. Currently, the Maybe Sump’ms have raised over $18,000 for the National MS Society! This is our best year yet! THANK YOU for being a huge part of that! That said, we’re still taking donations through 11/16. Feeling like adding a little more to the pot? Four members of the team are in this year’s top 200 fundraisers. The team is in the top 10 for family/friends teams, and it looks like the same can be said for the corporate teams as well. This is awesome! Thank you again for supporting our ragtag team of rockers, family and friends! You can now interact with the blog using Twitter, as well as your Facebook account. #crashsafely <3. Sunday is the bikeMS ride! This is where the Maybe Sump’ms (and all the Crash Safely folks) are going to be recognized for all of their hard work. For some, this is where the challenge really lies; they’re biking 30, 50 or 100 miles. For the virtual riders, we get to decorate the team village area and scope out where the best freebies are located. Photos from both nights of Crash Safely will be decorating the Maybe Sump’ms Team Village area, as well as a copy of the poster and the random 20 yuan that was donated. Many thanks to Johnny Anguish, Crystal Bailey, Mick Murray, Mike Oliver and all of the other photographers who came out and took so many amazing pictures of the nights! I’m looking forward to the odd looks from the more <ahem> traditional teams when I put up some photos of the Upper Crust. Now then, off to prep for a whirlwind weekend!